There has been a rather serious shortage of water in Little Irchester, near Wellingborough, for the last, fortnight or so, most of the wells of the village, the chief source of supply, having dried up almost entirely. This shortage, due in some measure to the absence of rain for some period, is also believed by the inhabitants to be duo to the sources of the wells having been interfered with by the ironworks established at Little Irchester about 12 months ago by Messrs. Pain, of Corby. It is thought that in the field in which the ironstone is being excavated several of the springs of the wells run, and these being interfered with, the wells have not received their usual supplies. One well which supplied 16 houses, near the Prince of Wales' Inn, the property of Mr. Butcher, has run dry, a well which has never been known to be short for 40 years. The other wells in different parts of the village, too, have not suffered from shortage for some considerable time. There are a few wells which have not suffered and from the owners of these some have drawn their supplies whilst others have taken theirs from the river and from a spring just outside the village. Very fortunately, the mains of the Rushden Water Board run through the village and with these about half of the houses are connected, and the others are being supplied from this service this week. This is a plentiful supply, coming from Sywell, and since its coming to the village about a year ago has gradually been taken by the inhabitants. Hinwick - FlaxAt the meeting of the Higham and Rushden Water Board on Monday the Surveyor (Mr. W. Madin) reported: “Since the last meeting of the Board we have made a connection off the pumping main in Podington parish to supply the camp of flax pickers on the Hinwick estate. The Board’s men were assisted by the Royal Engineers, who laid the mains, fixed the tanks, etc. There is a good supply available, but, owing to the limited storage capacity, it will probably be necessary to pump for a little while each Sunday”. A large number of girls arrived early this week. Arrangements are being made locally to provide the flax pickers with amusements. The monthly meeting of the Higham Ferrers and Rushden Water Board was held in the Council Buildings, Rushden, on Monday. Present: Messrs Owen Parker, J.P., O.B.E. (chairman), John Claridge, J.P., C.C. (vice-chairman), T. Patenall (Mayor of Higham Ferrers), J. H. Johnson, T. Swindall, F. Knight, J.P., John Spencer, J.P., T. Wilmott, J.P., with the Clerk (Mr. G. S. Mason) and the Surveyor (Mr. W. B. Madin). The pumping plant at Sywell continues to give every satisfaction. The water in the storage reservoir decreased 3¼ inches during June, and on June 30th was 3¾ inches below the overflow weir, and the estimated quantity impounded was 230,988,000 gallons. The average daily consumption in Higham Ferrers and Rushden during the month was 227,166 gallons compared with 248,666 gallons for the corresponding month last year. *For the corresponding month last year the amount was 778,000 gallons. OverflowingThe water at the Sywell reservoir of the Rushden and Higham Water Board is now overflowing. On Wednesday at 8a.m. the water began to overflow at the rate of about a million gallons a day, and to-day (Friday) the overflow is at the rate of five million gallons in 24 hours. The reservoir had not, until Wednesday, overflowed since March 8th, 1921. The monthly meeting of the Higham Ferrers and Rushden Water Board was held at the Council Chambers, Rushden, on Monday evening, when there were present: Mr. C. Claridge (in the chair), Mr. G. W. Coles, J.P. (vice-chairman), Ald. T. Patenall, Ald. J. H. Johnson, Ald. F. D. Brazier, Messrs. J. Hornsby, T. Swindall and A. Wilmott, with the Clerk, Mr. G. S. Mason and the Surveyor, Mr. J. W. Lloyd. The report of the Surveyor stated: “The water in the storage reservoir fell 1ft during September, and on the 30th of the month the level stood at 2ft 2ins below the overflow cill. The estimated quantity of water in stock was 197,920,000 gallons, compared with 195,171,000 gallons last year when the level of the water was 2ft 4ins below the cill. The following were the quantities of water sold in bulk: To Irchester, Knuston Spinney meter, 775,000 gallons. Water Tower meter, 1,116,000 gallons a total of 1,891,000 gallons; Wollaston, 715.000 gallons; Wymington, 161,000 gallons; Mears Ashby Hall, 9,000 gallons; Earls Barton, 125,000 gallons; a total of 2,901,000 gallons compared with 2,486,000 for the corresponding period of last year. The quantity of water consumed in Higham Ferrers and Rushden was 12,115,000, a daily average of 403,833 gallons, the figures for September last year being 11,810,000 and 393,666. During the month there were two new services and two extensions at Rushden, and one new service and one extension at Higham Ferrers. The Surveyor submitted an application from Mr. Arthur Sanders asking the Board to lay the water main in part of a new road his firm is making off Wellingborough-road. The part referred to was about 200 yards long, and there would be room for 30 houses. 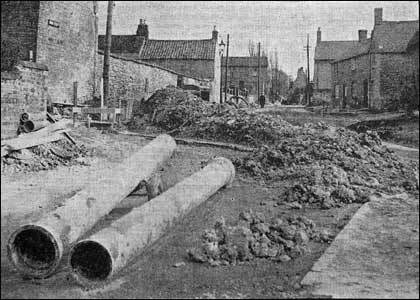 Regarding the application, the Surveyor stated, in reply to Mr. Swindall, who said that the Allotment Association were asked to pay for part of the main themselves when Purvis Road was made, that on that occasion the road was not made up and the main laid was 1½ inch pipe, which later had to be replaced by a four inch main. The new road was being made up now and the Gas Company were already laying their pipes, he said. The Board agreed to lay 200 yards of four inch pipes, and to purchase two trucks of anthracite. The Surveyor’s report was passed as satisfactory. A new and more powerful electric pump may be ordered for the Higham Ferrers and Rushden Water Board’s main works. At Monday’s meeting of the Board, however, it was stated that a licence would have to be obtained before the engine could be supplied, and this might take some time. Inquiries are being made, but the Board has not yet made a decision. The Surveyor (Mr. J. W. Lloyd) reported that the level of the water in the storage reservoir had fallen six inches and at the end of September stood at 1 ft. 8 ins. below the overflow, the stock being estimated at 203,317,000 gallons, compared with 154,700,000 gallons at the same time last year. The September rainfall at Sywell was less than half an inch. Bulk sales for the month were:- Irchester 2,196,000 gallons (including 172,000 for Podington), Wymington 176,000, Mears Ashby Hall 13,000, Wollaston 953,000, Great Doddington 105,000: total 3,443,000 as compared with 2,923,000 last year. Rushden and Higham Ferrers consumed 13,273,000 gallons. “We shouldn’t be short of water now,” observed the chairman (Mr. A. Allebone). Members present were Councillor A. Allebone, J.P., C.C. (chairman), Alderman F. Walker, J.P., Councillors F. Green, J.P., E. A. Sugars, J. H. J. Paragreen, J. George, J. Allen and E. J. Wright. The explanation of the more satisfactory water supply for Rushden and Higham Ferrers, reported by the Surveyor and Engineer to the Water Board (Mr J W Lloyd) is the installation of more powerful plant at the boards secondary works near Doddington (actually in the parish of Wollaston). The diesel engine originally used has been replaced by electric motor driving a centrifugal pump. This plant, now in operation, has increased the quantity of water pumped to the service reservoir in Bedford-road, Rushden, from 10,000 gallons an hour to 20,000 gallons. This is used during the week, and the pumping plant at Sywell is operated at week-ends. The doubled output may be still further improved on at the Doddington works if the big well from which the water is drawn can itself fill more quickly when drawn upon. The method recommended by the experts is to drive "headings" in various directions into the gravel stratum which is the source of the water supplying the well. The quicker flow into the well would not, it is believed, affect the natural source. A satisfactory increase in the quantity of water stored at the Sywell reservoir was again reported when, Higham Ferrers and Rushden Water Board held their monthly meeting on Monday. The Surveyor (Mr. J. W. Lloyd) reported that the level of the water at Sywell at the end of February was only 8 ft. 9 in. below the overflow cill (a rise of about four feet) and the amount estimated to be in store was 159,396,000 gallons. Twelve months previously the water was 23 feet below overflow and there was only 13,163,000 gallons. For all but 19 hours during February, water had been pumped from the Wollaston works, the latter yielding 16,485,000 gallons during the month. Water had been sold to outside authorities as follows: Irchester, 1,827,000 gallons; Wymington, 431,000: Mears Ashby Hall, 12,000; Wollaston, 707,000; Gt. Doddington, 132,000, a total of 3,109,000 gallons. The consumption of water at Rushden and Higham Ferrers showed an increase from 9,708,000 gallons in February, 1944, to 12,094,000 gallons last month. Members present were the vice-chairman (Ald. J. W. Barker), Ald. F. Walker. J.P., Couns. E. A. Sugars, J. H. Paragreen, J. George, E. J. Wright, and F. Green, J.P. THE public will be grateful to Ald. Frank Walker, of Higham Ferrers, for disclosing some part of the proposals for an area water supply based on Northampton Borough Council's new scheme. Higham Ferrers, Rushden and other places have been invited to participate in the opening discussions, and though there is no likelihood of a decision being taken in the early stages it is important that all the representatives should speak from full knowledge of local facts and feeling. In our own district the Higham Ferrers and Rushden Water Board gives efficient service under normal conditions but was not smart enough in action to prevent a shortage in last year's supply.Thanks to the auxiliary supply (which was not called into use as soon as it ought to have been) and the improvement of that supply during last year's crisis, there appears to be ample provision for the present needs of the district and for meeting a considerable extension of the demand. The auxiliary water, however, is taken from the Nene gravel beds, and the Board will at any rate I have to make sure that the Northampton scheme of diverting water from the river in winter does not affect the source of supply. As to costs, it is certainly true that this district does not want to lose all the benefits that arise from the fact that the capital cost or Sywell has been liquidated and also from the fact that the Wollaston installation was inexpensive. Even now our service is by no means the cheapest in the county, and the heavy expense of putting in a duplicate main may still arise. No-one wants the cost of water to multiply. It is to be hoped that the Water Board and the local Councils will be fully on the alert and fully informative as the Northampton overtures take shape. Building of a water tower to improve and extend Rushden’s supply may be deferred for six months by order of the Government. A letter from the Ministry of Health, read at the Higham Ferrers and Rushden Water Board’s meeting on Monday, approved tenders for the laying of new mains at a cost of £19,471. With regard to the water tower in Bedford-road, however, it was stated that steel and timber were in short supply and that in the Minister’s opinion this work was not of such urgency as would require it being commenced forthwith. The Ministry suggested that building should be deferred for six months. The Clerk (Mr. A. G. Crowdy) said the Board’s consulting engineers were now in touch with the Ministry, who were being informed that the steel tank for the tower was due for delivery in October and that a water supply would be needed for the 66 houses which are to be built in Newton-road. Members agreed that it was important to have a supply ready for the new houses. Ald. F. Walker was told that no pipes had been delivered up to the present. Mr. J. H. J. Paragreen, of Rushden, was unanimously elected chairman of the Board, and Mr. E. J. Rowlett, of Higham Ferrers, succeeded him as vice-chairman. Mr. Paragreen invited his colleagues to join him on a visit of inspection to Sywell on June 30th. A continuous overflow from the Sywell reservoir during April was reported. After the general business, the Board held a private discussion on the proposed county water scheme. The new Rushden water main from Wollaston has reached Wymington and a stretch has been laid along the High Street. It has been a muddy time for local residents. The laying of the main coincides with the laying of drains from the new housing site. When Rushden Urban Council met, the Medical Officer, presenting his annual report, told them that the district contained an estimated population of 14,359. There were 434 births registered and 150 deaths. "The water supply is at present insufficient," he said "The Urban Council have, however, done their utmost, and have expended considerable sums in boring in different localities, at present without satisfactory results." Trade competition between the clubs and the licensed victuallers was put aside for the Urban Council elections. Together they formed a new party. Commented the 'Argus':"The combination has been viewed by the majority of club members with feelings of suspicion and doubt." Despite the risk of a large draw-off of water from the tower in the event of fire, Higham Ferrers and Rushden Water Board have agreed to Messrs. Geo. Selwood and Co. Ltd., connecting the sprinkler valve system in their Rushden factory to the new main in Newton Road. The Surveyor pointed out that there would be a large draw-off in case of fire, though it was unlikely that all the sprinklers would be in operation the whole of the time. It would be possible for the tower to be emptied in a long period. In any case, the fire service would probably draw off more water than the sprinkler system. Contractors have started working on the replacement of pipes at Hardwater Crossing. The level of the water in the reservoir rose three inches, and on February 28th stood at 7ft 9ins below the sill. There were 119,083,536 gallons available. Last month Rushden and Higham Ferrers used 497,643 gallons of water a day. Total consumption was 13,934,000 gallons. Bulk supplies totalled 3,695,000 gallons, 1,321,000 gallons going to Irchester and 1,442,000 gallons to Wollaston. Members present were:- Councillor E. J. Rowlett (chairman), Alderman J. W. Barker and F. Walker, and Councillors J. Allen, T. W. Cox, F. Green, J. H. J. Paragreen, E. A. Sugars and W. E. Capon. Now nearing completion, the big extension scheme of the Higham Ferrers and Rushden Water Board is estimated to cost £74,250. The original estimate was £66,500, but costs have risen, and the announcement of sanction to a supplemental loan of £7,750 was made at the board’s meeting on Monday. The scheme includes a water tower in Bedford Rd., Rushden, and miles of new supply and distribution mains. The Board decided to buy 100meters, and these will cost over £500. “Whether the Board should postpone the purchase of remote control apparatus so that the depth of water in the Wollaston and Irchester towers can always be known at the Sywell pumping station was debated at some length. The Board has managed without such apparatus for many years, but on two occasions a tower has emptied before the engineers were aware of it. Councillor T. W. Cox said another incident of this kind would be a blow to the reputation of the Board, which had just been lauding itself as being capable of maintaining its water supply to the district. Other members agreed, and it was decided to expedite inquiries. The Surveyor (Mr. A. Millar) reported that the Sywell reservoir contained 133,431,000 gallons as against 164,111,000 gallons twelve months ago. Rainfall at Rushden in March was 1.28in., Rushden and Higham Ferrers used 14,699,000 gallons, and bulk sales totalled 4,390,000 gallons. Members present were Messrs. E. J. Rowlett (chairman), W. E. Capon, E. A. Sugars, J. H. J. Paragreen, F. Green, T. W. Cox, J. Allen, and J. W. Barker. A replacement to the existing main in Cromwell Road, Rushden, at a cost of £550 recommended by the Surveyor owing to re-construction of the road, was agreed to by members of the Higham Ferrers and Rushden Water Board on Monday. The Surveyor’s monthly report showed a consumption of 16,490,000 gallons in the Higham Ferrers and Rushden area, a daily average of 549,000. The June downfall of rain at Sywell, Wollaston and Rushden was the lowest for many months. With regard to the laying of water to the Court Estate, J. H. J. Paragreen was told there had been 70 applications for the service. It was pointed out that when the main was laid the liability of the Council in conveying water to the estate would cease. For those not taking advantage of the service it would be a matter for the Sanitary Inspector. Although a number of farmers in the Rushden area have had to appeal to the Urban Council for tanks of water during the weeks of drought, the town’s supply is still safe. In recent years, whenever there has been no rain for a long period, the local authority have had to restrict the use of water, but this year, now that the Water Board’s new mains have been laid, there have been no “Save Water” notices. In the past it has not been so much the shortage of water which has affected the higher parts of the town, but the lack of pressure. The building of the new water tower and laying of the main has solved the problem in these areas, although the Board are still keeping a water cart at the Court Estate as at the moment, all the residents have not had their homes connected to the new main. There were seven inches of rain up to the end of June in Rushden, compared with 12 inches for the corresponding part of last year. At the moment the water is 11 feet below the cill at the reservoir, the total depth of which is 35 feet. Much water, however, is drawn from underground sources at Wollaston. At the monthly meeting of Higham and Rushden Water Board on Monday it was decided to lay a new three-inch water main in place of the present threequarter-inch galvanised pipe which supplies 14 houses in Vine Hill Drive, Higham Ferrers, and houses in Russell Way and Cemetery Lane. The estimated cost is £500. It was stated that the booster station, Wellingborough Road, was started on June 21st and was functioning satisfactorily. It was servicing the major portion of the south-west parts of the town, giving an increase of approximately 40 lbs. pressure over the whole area. At the present time it is in operation from 7 a.m. till 8 p.m.
A letter was received from Messrs. H. T. Mackness Ltd., Beech Road, Rushden, to the committee complaining of poor water supply. They stated that this matter had been raised prior to the war when it was suggested that a larger pipe should be laid. The committee could find no record of this in the minutes. The present main pipe was 2 ins. in diameter, stated the surveyor, and, if this was relaid, would entail 80 yards of 3 ins. main. After debating in the committee, the surveyor said that the pressure was there for a larger pipe and it was agreed to lay the new pipe if it was necessary. There has been a fall of four inches in the storage reservoir and the water is now 4ft. 10ins. below the cill. It was proposed to commence the work of installing a new suction pipe to the pumps of the water tower into the reservoir, in Bedford Road, on Saturday, August 5th. As it will be necessary to empty the reservoir, the opportunity is being taken to clean it out at the same time, and pumping will be direct into the supply for a short time. The holiday week was chosen because consumption would be lower than normal, and it meant pumping water from Sywell straight into the mains. It has been 25 years since the reservoir was last cleaned and a six-inch deposit of harmless silt was found at the bottom. Measuring 12 feet in length, 96 feet in width and 18 feet in depth, the reservoir was no small job to tackle, for the floor and white-tiled walls had to be brushed and scraped and fire hoses were used to flush the residue away. Sixty-three iron columns also had to be attended to, and work over Friday, Saturday, Sunday and Monday carried on until 10 o’clock at night with the aid of electric lamps. The work of laying the new pipe was also something of a problem, for it meant knocking a hole into the wall of the reservoir. This was so thick that it took two days to break through. Everything was completed on Tuesday evening, however, and only the trench housing the new pipe remained to be filled in. The Bedford Road reservoir pumps, in a normal hour, between 40 and 50 thousand gallons. This was reduced to 20,000 gallons per hour during the early part of the week owing to the holiday exodus. Its capacity is 840,000 gallons  a day and half supply for Rushden and Higham. Reasons why Wymington should not be included in the Higham Ferrers and Rushden Water Board's proposal to extend the boundaries of their area of supply, were heard at a five-hour inquiry at Rushden Council Buildings on Friday. The inquiry was conducted by Col. G. Ewart Rhodes, senior engineering inspector to the Ministry of Health. Mr. Harold Marham represented the parish Councils, the objectors, and Mr. A. G. Crowdy (clerk) presented the case for Higham Ferrers and Rushden Water Board. Wellingborough Rural Council have been co-promoters of the order which will transfer to the Board the existing undertakings in Bozeat, Great Doddington, Earls Barton, Easton Maudit, Ecton, Grendon, Irchester, Mears Ashby, Newton Bromshold, Strixton, Wilby and Wollaston, at present under their jurisdiction. In lodging objections to the transfer of the Wymington undertaking, Mr. Marham said that the Higham Ferrers and Rushden Water Board in two years ago when they were threatened by the Mid-Northants Water Board. Mr. Marham said there was no reason why an agreement could not be made whereby Bedford Rural Council paid 1s. 4d. per thousand gallons for their water instead of the present price of 10d. As far as maintenance was concerned, it was a perfectly simple matter for the Rural Council's workmenwho were maintaining 200 miles of pipes in the areato look alter Wymington. As a result of the Ministry of Local Government’s decision following the public inquiry at Rushden on January 12th, 12 parishes of Wellingborough rural area will become members of the Higham Ferrers and Rushden Water Board. As constituent members, they will have four representatives on the Board. Most of the parishes have already been purchasing their water in bulk from the Board through Wellingborough Rural Council. The objection of Bedford Rural Council to the transfer of the Wymington undertaking into the Board’s area was upheld. The Minister referred to doubt as to whether he had power to order the transfer, and in his letter to the Board he said that he did not consider that the transfer would carry with it any practical advantages. A scheme which is being considered by Rushden and Higham Ferrers Water Board would not only help to beat any water shortage this summer, it would also make sure that the British National Water Ski Championships can take place as planned. This year the championships will be held at the Rushden Skew Bridge Ski Club. This is the first time that these championships  the most important water ski event in this country  have been held outside the London area. Yesterday the club’s Press officer, Mr. John Humphrey, told the “Echo” that they were very concerned about the water level. “At the moment it is all right in the deep parts, but we cannot use the shallow ends,” he said. A spokesman for the Water Board said at the moment Ferrersand Aggregates Ltd., were pumping water from an area they were working into the River Nene. “We do have a scheme afoot to pump this water into the Ski Club pit and then to pump from the Ski Club to Ditchford. “If this scheme was introduced we would pump 60,000gallons of water an hour into the Ski Club, and pump out 20,000 gallons an hour,” the spokesman said. If adopted, the scheme would be used mainly for the benefit of domestic supplies, he said, but this was a case where the board and the Ski Club could help each other. Generally speaking, the water position in this area does not seem to be as bad as in neighbouring towns. The water level at Sywell has increased slightly, but the board’s restriction on hoses for cars and gardens still applies. Assuming the water levels are high enough in July, this year’s championships look like being better than the English Native Championships, which were held at the club for the first time last year. Northamptonshire’s reservoirs are almost half full, after a month in which the rainfall was above average and the water situation is considerably improved. At present the reservoirs contain a total of 2.288 million gallons, 1,616 million gallons of which are at Pitsford. Consumers must still use the water carefully.